Can-Do Trail, May 23, 2011. 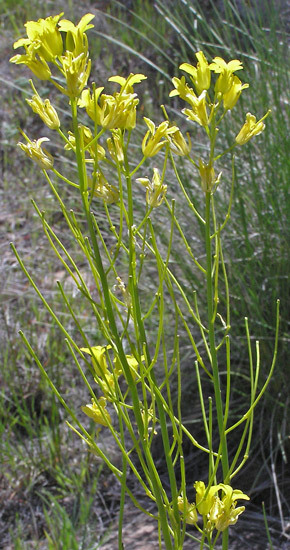 Sisymbrium linifolium has bright yellow flowers surmounting tall slender stems with few narrow leaves. 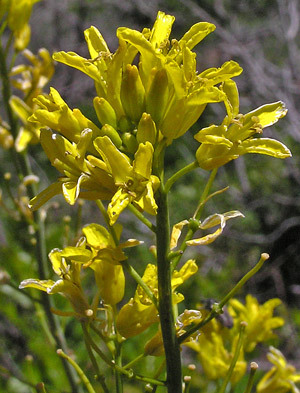 It is common to find clusters of dozens of these plants with numerous flowers on each plant giving a golden glow to their typical woodland habitat. They also impart a delicious sweetness to the air. Be sure to put your nose down into the flowers. Sisymbrium linifolium often grows with Penstemon strictus in such areas as Mesa Verde National Park. Sisymbrium linifolium's leaves are often glaucous (blue-green). Leaves range from entire to few-toothed to pinnatifid to pinnatisect, and, as indicated by the red and dying leaf in the second photograph, they begin dying around flowering time. Linnaeus named the Sisymbrium genus in 1753. "Sisymbrium" is a name given by the Greeks several thousand years ago to a plant in the Mustard Family. Nuttall at first named this species Nasturtium linifolium from a specimen that Wyeth collected in 1833, but Nuttall renamed the species Sisymbrium linifolium in 1838. "Linifolium" is from the Latin for "linear leaves". 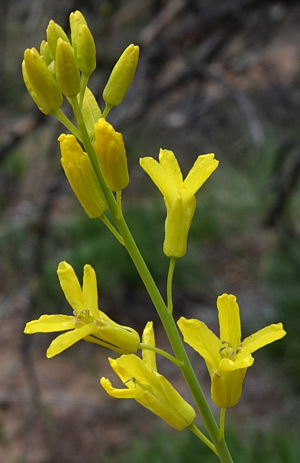 William Weber notes that the Flora of North America calls this plant, Sisymbrium linifolium, but Weber calls it Schoenocrambe linifolia, a name given by Edward Greene in 1896. "Schoinos" is Greek for "reed" or "rope" referring to the long almost leafless form of the plant. "Crambe" is the Greek name for "cabbage". Upper Sand Canyon Trail, April 28, 2015. 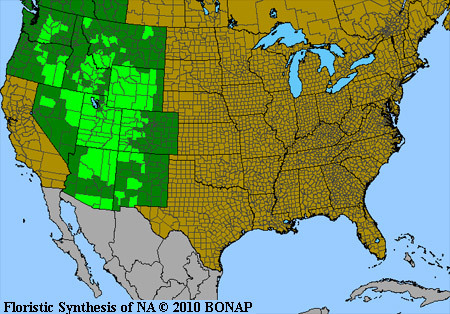 Canyons of the Ancients National Monument, April 27, 2007. Schoenocrambe linifolia's seed pods are long, narrow, and gently arched upward.